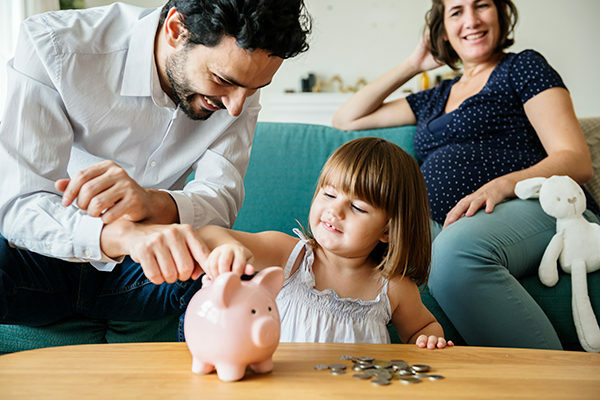 As a busy mum of two girls under six, blogger Olivia White of House of White, knows how hard it is to manage your money when you’ve got a young family. “Everyone thinks of “saving” money as “spending less” but the best place to start is with the money you already spend,” she says. You’d be really shocked at how many things you might have coming out off your account that you didn’t even realise. Small debit amounts for gyms, online subscriptions and apps! I was paying for a lot of cloud-based items like storage and premium apps that I thought I cancelled, or hadn’t even realised I signed up to, at one stage. These amounts all add up over the months! Even our daughters’ swimming was still coming out when I changed centres and cancelled (they didn’t do it). So I had to follow it up and get back paid. A great way to check also is go into your subscriptions in iTunes and see what is active. Another great way is to check your PayPal account and see what is active there, you might have a recurring payment authorised you don’t want or need. Depending on how and where you save your money, set up a manageable amount you can part with each week/fortnight/month so it’s building up without you even seeing it. We save via our home loan, so I have a manual direct debit each week to pay this PLUS a set amount on top that goes with this weekly. This means we are building our savings against our home loan which is also offsetting our loan. I find this is a great way for us as it’s out of arm’s reach to access the money (we need to go into a branch to get it out as we didn’t set up online banking for it). Even if you just had $20 a week automatically going into an account on payday, you just become used to it and don’t see it happen so you’re unlikely to touch it! If you use a credit card like me, then making sure you have the best card for your circumstances is critical! We use our card to pay for everything, then pay it off each month (never paying interest). We also use it to collect Qantas Frequent Flyer Points, so having a card with the best points was a big thing for us. Look at annual fees versus the interest rates to see what it’s really costing you each year compared to the value of the points you collect as well. As mentioned, we collect Qantas points and so its dictates where we shops for groceries (Woolworths for Everyday Rewards/Qantas Points), petrol, who we fly with and what type of credit cards we have to maximise this! It also means we shop largely with a credit card so every dollar we spend earns us points. I do however only recommend this if you can afford it. If you are paying interest on a credit card then it’s never going to be worth it. Always consult your banking institution or an independent financial advisor if you want to know if this is right for you.